Twenty of the finest animation companies in the world got involved to make films about the various treatments these children will experience on their journey to recovery. Each film features an “imaginary friend” who will look after you and guide you through the process. Our film deals with radiation therapy, a baffling procedure at first glance. An initial script from RPA was expanded and developed with the help of Trunk director Jock Mooney, to create one that is full of fun. Set in a child’s bedroom at night, a time when a young child may feel particularly vulnerable and alone, the helpful imaginary friends appear. We meet Walter, a suave secret agent character (Julian Rhind-Tutt) and his gluttonous sidekick Gus (Jane Horrocks). The pair go on to explain the process of radiation therapy whilst touring the bedroom in all forms of animation and puppetry! Trunk wanted to create a film that had real warmth and that could inspire a can-do attitude. The team wanted kids to see the film and feel like they could make something similar in their own bedrooms. So out came the craft box. Followed by LOADS of help! One of the most amazing things about making the film was the amount of time and the generosity of so many companies and people that got involved and helped out. It has truly been inspiring. It started with the amazing performances of Julian Rhind-Tutt and Jane Horrocks, who were such a pleasure to work with and whose performances created great opportunities for the animators. Who in turn drew snappy, well timed movement, in such a short space of time. The amazing James Cropper Paper provided us with such beautifully textured paper to give our characters some depth, and hordes of friends and family took up the scissors to help with cutting out each frame. The incredible DOP Pete Ellmore, who lit the set beautifully for the mix of stop motion and live action techniques, worked with the small but mighty crew of Jono Yates and Ollie Craig. 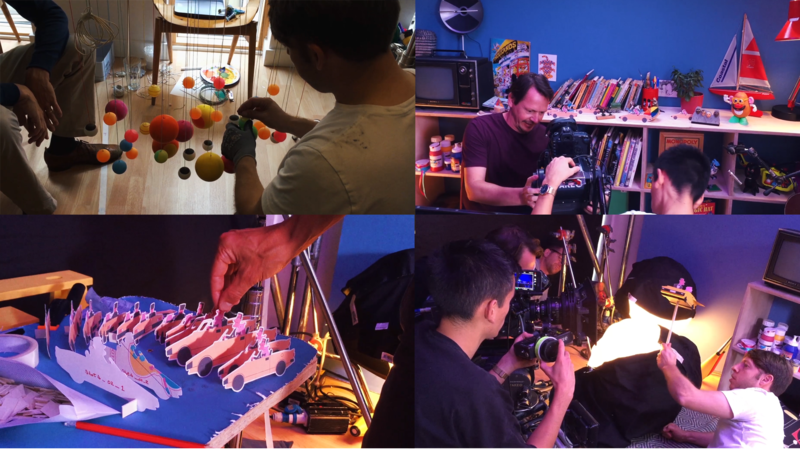 Using top quality equipment loaned to us by Take 2 Films, Clapham Road Studios and Panalux. The film literally couldn’t have happened without their support. The shoot lasted a gruelling seven days, over which the team wrangled with thousands of pieces of artwork, props, a model car and an unruly bunch of ping pong balls. Our compositor Rok Predin then had the daunting task of pulling everything together, ironing out small mistakes, adding lasers, and making all those frames stand up and be counted! With composer Daniel Pemberton taking time out from scoring Ridley Scott’s new feature to give our film a soundtrack, and the team at Fonic bringing every action to life with a beautifully crafted sound bed and mix, the film was given depth and beauty. MASSIVE THANKS TO: Everyone involved in the making, as well as those behind the scenes: Kate Davie @ United Agents, Barry Measure and Asha Chander @ Take 2 Films, Kelly Amundsen @ Panalux, Tim Nattrass @ James Cropper Paper, PCR Ltd, John Whitten @ Whitten Timber, Paul Haslem @ Benwells, Elizabeth Day @ Clapham Road Studio, BIG Thank you to Jock Mooney.